A CinderBlock is a prepackaged collection of code and libraries which implement a feature or exposes a library in Cinder. This includes bridges to libraries like OpenCV and FMOD, as well as standalone implementations of features like TUIO support. 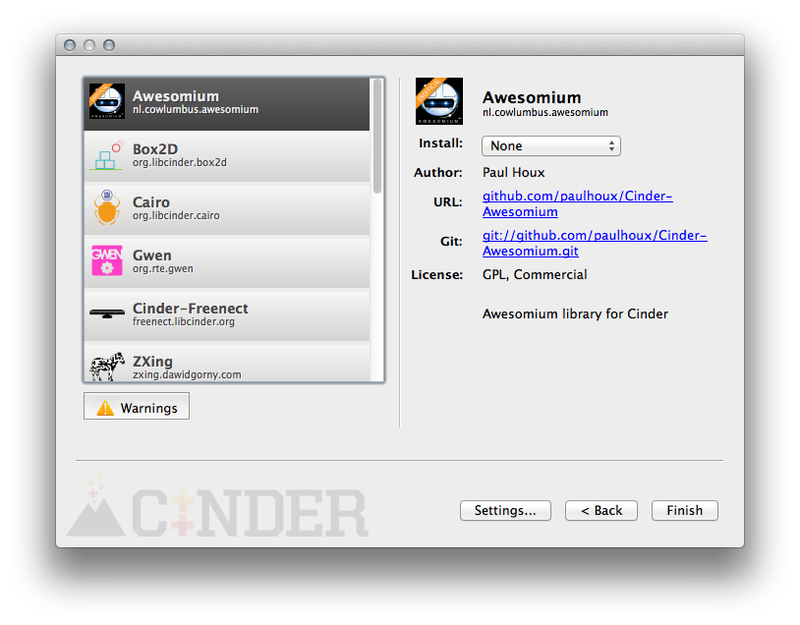 Cinder ships with several built-in CinderBlocks such as QuickTime and the LocationManager. A CinderBlock can include source, headers, libraries and any other resources it depends on. 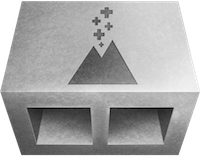 To learn more about using CinderBlocks from TinderBox, checkout its documentation. The information which follows is only relevant to CinderBlock creators and maintainers. "name" (string): The human-readable name of the block. Ex: "FMOD"
"id" (string): The unique identifier of the block expressed in reverse-dns. Ex: "org.libcinder.fmod"
"git" (string): The URL of the CinderBlock's repository. Ex: "git://github.com/cinder/Cinder-OpenCV.git"
"author" (string): The author or authors of the CinderBlock. Ex: "Cinder Project"
"summary" (string): A paragraph-long description of the block and its purpose. Ex: "The FMOD API is a library for the creation and playback of interactive audio." "license" (string): The software license associated with the library. Ex: "GPL, Commercial"
"version" (string): The version of the underlying library when applicable. Ex: "4.44.06"
"library" (string): The URL for the library a CinderBlock may wrap, Ex: "http://www.fmod.org/"
This path is replicated in the output, so a file that lives at include/example.h will be copied to <span style="font-style: italic;">project-path</span>/blocks/<em>blockName</em>/include/example.h. <resource>: A resource file. Added to Resources.rc on Windows, and added to the Resources group and build phase in Xcode. "id" (int): The integer ID of the resource - only applies on MSW. If omitted TinderBox automatically creates a unique ID for the type. <asset>: An asset file, added to the project's assets directory. Note: Uniquely, assets are copied to the project's assets folder regardless of the install type the user has selected for the CinderBlock. <buildCopy>: A file which is copied to the folder containing the build product as part of the build process - typically a DLL or dylib. "destination" (executables | frameworks | plugins ): The Xcode destination type; the default is executables, which corresponds to the Contents/MacOS folder. "system" (boolean): When true specifies a system header, i.e. #include <something.h> rather than #include "something.h"
<headerPattern>: Adds as headers all files matching the pattern, including wildcards (*) <headerPattern>include/*.h</headerPattern>. <sourcePattern>: Adds as source all files matching the pattern, including wildcards (*) <sourcePattern>src/*.cpp</sourcePattern>. <setting>: Allows modification of an Xcode setting (OS X-only). The value of the element becomes the value of the setting. <platform>: Specifies an OS, compiler, build configuration or iOS SDK. Explained further below. "os" (msw | macosx | ios): Specifies the supported operating system. "compiler" (xcode | vc2012 | vc2013): Specifies the supported compiler. In the example above, both debug and release configurations on MSW would include the header myLib.h, but the MSW project's debug config would have myLib_d.lib added, while its release config would have myLib.lib added. A hypothetical OS X project would receive none of these files. A CinderBlock may optionally supply one or more project templates, which are meant to serve as a starting point for using the CinderBlock. For example, the OpenCV CinderBlock includes a project template which loads an image and performs a basic image processing operation on it. Include an icon: TinderBox will detect and show a cinderblock.png if present. This should be at least a 72x72 pixel PNG with an alpha channel. Setup a git repo: In order to allow users to include your library as a git submodule, it must have its own git repository. Consider minimalism: In many cases a minimal CinderBlock-specific API is preferable. An example is the Cinder OpenCV block, which serves more as a shim than as its own interface. Particularly when a library is already object-oriented, it may be the best design decision. It requires less maintenance and allows a user who is already familiar with the library to utilize her knowledge of it, rather than having to learn an "API to an API". Pursue loose coupling: For visually-oriented CinderBlocks, this may mean separating the render logic out into other classes or functions, particularly in the sense of not assuming an application is using OpenGL. Weigh binaries: In many instances a static library is unnecessary, and simply including a library's source files is adequate. This simplifies maintenance and allows the library to be used on platforms you may not have immediate access to. The CinderBlock for Box2D is an example of this technique. Other libraries, like OpenCV, must be static libraries. A natural decision maker would be whether the library requires a build system like CMake. Favor static over dynamic libraries: Cinder apps are designed to be self-contained whenever possible. Libraries should be universal binaries, supporting the i386 and x86_64 architectures on OS X and the armv7 and arm64 architectures on iOS. Where necessary, the C++ stdlib should be libc++, and the C++ Dialect must be C++11. Make sure the C Runtime is Multithreaded Debug (/Mtd) for debug and Multithreaded (/MT) for Release. Advanced users may want to create new App template types. An organization may have a style they'd like all applications to conform to, or you may find yourself creating the same sort of application frequently. These templates are located at Cinder/blocks/__AppTemplates. Inside you'll see a directory for each of the default application types, and you can create your own here as well. Very advanced users may find cause to modify lower level parameters of the Xcode and Visual C++ project files TinderBox creates. If you are familiar with the internals of your compiler's project files, you can modify the files located at Cinder/blocks/__AppTemplates/__Foundation. A key attribute of these files is that the string _TBOX_CINDER_PATH_ will be replaced with the absolute file path to Cinder, and the string _TBOX_PREFIX_ will be replaced with the user-provided project name.